A peer-to-peer extension of DIET. 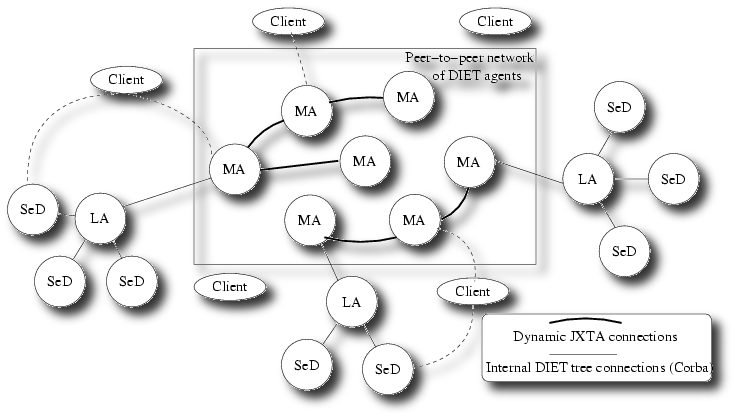 To extend the field of the available services for a given client, DIETJ dynamically connects several DIET hierarchies. Within DIETJ, the several MAs access each others’ resources when processing a request, thus offering to the client an entry door to resources of several hierarchies put in common in a transparent manner. This results in avoiding the growing probability of bottleneck on one MA facing all requests thus increasing the scalability of the whole system. DIETJ is currently written in Java and relies on the JXTA-J2SE toolbox for the on-demand discovery and connection of MAs. Remind that the available version is a prototype. For more information, refer to the DIET user’s manual. Questions about DIETJ can be directed to Cedric Tedeschi.